You have some wonderful traditions here! I’m sorry to read so many comments on your article that are closed to the idea that being interfaith can enhance relationships and honor both traditions. I think your words will help change that. We celebrate both – though me being the lazy Jew that I am, would rather just do Christmas since I aim to have the best light display. But we do it for the kids. Dear John, any place is good to worship God and as you say we do not to have special buildings to honour the Creator, Elohim Jehovah. Neat — if I have to say I’m celebrating anything, I suppose Yule is closest since it’s just the winter solstice with eggnog, really. I like the fact that the wheel of the year holidays are focused on actual events in the real world as opposed to “beliefs,” whatever they are. “Well, my people believe that blah blah blah … ” The fact that the sun is as low in the sky as it will ever get isn’t a matter of belief, you can point to it. And do they make Hanukkah bushes that don’t look so much like Christmas trees? First time I heard of them, I envisioned a sort of tabletop roundish shrub, which I think would be way nicer than what looks suspiciously like a repurposed Christmas tree. They really should have a specific shape to them that makes them look different. As one who is both Jewish and Christian, I well understand how the traditions as well as the faiths are not mutually exclusive, despite the fact that many see that as a contradiction in terms. Was not the New Testament written by Jews, for Jews and about Jews? I believe that the New Testament was written about 100 years after Jesus dies and was therefore written by the early Christains and not the Jews. Actually, Gail, this is not true. The early followers of Christ were all Jews. It was not until years later that Gentiles were even “allowed” to become followers as well. And initially Gentiles that chose to become followers of Christ had to become Jews themselves to do so (i.e., get circumcised; keep the Jewish Law, etc). After much disagreement, dispute, debate and conflict, it was ultimately decided that it was not fair to require the Gentiles to become Jews in order to follow Christ. And the rest, as they say, is history. The writers of both the Hebrew Scriptures and the New Testament were Jews. Not quite. The Apostle Paul, who wrote many of the letters in the New Testament, was a Pharisee. According to the most widely accepted scholarship, his letters were written only about 20 years after Jesus’ death, in the 50’s. The Gospels are a little later, with Mark probably being written in the 60’s, Matthew and Luke sometime in the 70’s or 80’s (I can never remember these dates, for some reason), with John, the last, being written 90-100. Alex already got the rest of it, though. Yes, Ken, the Apostle Paul was a Pharisee and a Jew. The terms are not mutually exclusive. The Pharisees were a Jewish sect during the Second Temple period. Those following this discussion might be interested in a new edition of the New Testament with Jewish commentary, just published by Jewish scholars led by Amy-Jill Levine, http://www.oup.com/us/catalog/general/subject/Bibles/?view=usa&ci=9780195297706. They explore how the New Testament was indeed written by Jews, for Jews, and about Jews. However, these scholars are Jewish, because they do not conclude that Jesus was the messiah. “These scholars are Jewish, because they do not conclude that Jesus was the messiah??! !” Hmm, interesting comment, Susan. But doesn’t that fly in the face of everything the Jews who wrote the New Testament spoke about? Seems to me that the primary point of the New Testament is that Jesus is the Jewish messiah of the Old Testament. Am I missing something? Thank you for sharing this. As the child of an interfaith couple, who has just recently gotten married herself, I have struggled with how to carry on my own unique, blended traditions with my new family. I have made the decision that I will continue to celebrate the holidays just I did when I was growing up. Those are my traditions. These traditions are not disrespectful, nor do they bastardize. Their combination creates something new and incredibly meaningful. I consider myself quite lucky to have been exposed to multiple faiths. From this perspective, I can see the commonalities, the ideas that should unite, and the ways in which people should come together. Happy Holidays to all! Here here from another interfaith home. You know the Advent Calendar of arles Queen? It’s a good idea! I love it! I know many families of interfaith and you are doing a wonderful thing. I only celebrate Christmas and didn’t do half as much stuff as your family did for charity. Ashamed of myself & vow to do better. I have no comment other than to say whatever makes a person happy. let it be. I love being of mixed faiths! It means twice the celebrating and twice the cookies…and twice the weight to lose after New Years! :p Great post! Traditions are great and integrating them together is even better! That’s awesome! What great ways to celebrate both holidays! I especially love the idea of giving the kids money for charity as a Hanukkah gift! I find it encouraging when people find a way to blend traditions without losing sight of their own cultural identities. If only we all could find such respect for each other’s celebrations, even joining in once in awhile. Have a great remainder of the holiday season! I am a Christian who worked in a synagogue for years and I love your story! I love that you are embracing traditions from both worlds! Have a great holiday season! Very nice post. We are an interfaith family and celebrate both holidays. Religiously we are Jewish. But I admit that my Christmas decor is more prominent in the house than the Hanukkah stuff. I agree with you about not mixing the two holidays. But co-existing seems to be just fine. I don’t think this makes you any less of a Jew or a Christian for celebrating both. If a anything, it’s a symbol of what things should be about — inclusiveness. I’m going to try those peppermint cupcakes! Thanks for stopping by! This debate is as bad as getting depressed on your birthday. The point is not to look at the dark side, but to look at every holiday or occasion as an excuse to celebrate life! Today, some of you may have heard on the news, a small plane crashed on Rt.287 in New Jersey. That site is 1/2 mile from my house. I heard the sound of the plane going down but didn’t know what it was until I heard what it was. Helicopters have been hovering over my house all day. Neighbors are picking pieces of the plane up from their backyards. I love life, people, experiences, holidays, and everything else that means I am alive. Last year I had the opportunity to experience something similar. That is indeed a fascinating experience, Marie. I’ve always enjoyed Advent calendars, but yeah, I’d probably pass on the candy too. We do it both. The first year my husband said we’ll call it a Hanuka bush and I said no way…it is a Christmas tree….we can do both but we don’t mix the symbols. Now, this year for Christmas dinner he will make his roast and Yorkshire pudding and we will have latkes also. Thanks for the kind words on your blog! Absolutely! As I said there, may you guys have a great holiday season! Thank you so much for mentioning Yule. As a Pagan, it’s often hard this time of year, especially with a primarily Christian family. I can’t go one holiday without my father-in-law teasing me about making a goat sacrifice or something. Thank you for being so open minded and bringing every tradition to life. Sam–Pagan interfaith families are common, and have many of the same issues I address on my blog. But also, I like to point out the pre-Judeo-Christian origins of many of the rituals and references in Judaism and Christianity. We’re all descendants of pagans, if you think about it. Merry solstice! It’s fantastic to hear how you and your family are celebrating all the impending holidays. Kudos for getting them all in! Happy holidays! I’m not christian, but still i celebrate christmas every year with my friends. Coz i love christmas too much..!!! I am in an interfaith family. I’m a Catholic and my husband’s a Muslim. It is quite challenging to be in an interfaith family, more so during the holidays where we have to choose between families to spend our holidays with – is it his side of the family or my side this year? Luckily for me, I have a husband who is gracious enough to spend our Christmas eve all four years of our married life with my family where we welcome Christmas eve with a party. Although we spend our New Year with his family. It’s a fair trade, don’t you think? More than a fair trade for me, actually. This was a nice read. And it’s nice to hear how your kids spent their 50bucks. 🙂 I’ll try to do that with my kid. My kids love that we light Chanukah candles and decorate the Christmas tree. They wish they got to rake in the presents, too. 😉 It’s a wonderful time to leave the politics of religion aside and celebrate love and blessings in however many ways. I am a lifelong Unitarian Universalist with my mother’s family having Jewish heritage, my aunt on that side having the only part of said family which still celebrates Jewish traditions. I have often wanted to know more and participate. Maybe someday I will get more of a chance. One year, many years ago, my mother and I were at their house for the first day of Hanukkah, which happened to be the day after Thanksgiving. Lots of fun. I would love to know more about this and other Jewish traditions. Great post– and I like the way you celebrate! Bravo! Are you thinking “I feel so ugly“? Being fully Jewish, I never had to deal with having to grow up with two religions. I would think it would be slightly confusing for the child growing up when they start to realize that the religions have completely different customs and represent totally different things for both holidays except for the inclusion of gift giving for totally different reasons. I guess you just try to make the best of it and get all the presents you can. What a lovely post. Having a mix of beliefs in my household as well, I am encouraged by reading not only your insightful blog post, but also the positive replies. Congrats on being freshly pressed…I look forward to reading more of your blog! Dear believer, Christmas is really a heathen occasion, though lots of Christians do prefer to keep those Celtic and other pagan rites. Why would an interfaith family keep to the pagan feasts, knowing that Jesus was been born on October 17, 4 bCE? When you read the Bible (Old and New Testament) it is clear that we ought to celebrate only one main feast, namely 14 Nisan or the Pasha. So why not just keep to that when there are Jews as well in the family, because it is the same day for them as for true Christians? I love this! My boyfriend is Jewish and I am Catholic, so naturally there is a lot of present buying and decorating for both. This year we made giant sugar cookies and shaped them by hand: a big red stocking, a menorah, and a dradle, and we shared them at our holiday party with friends. We also do our gift exchange the first night of Hanuakkah, and light the menorah as well as the Christmas tree. We start these traditions now because someday we’ll have children and we want them to know every bit of joy from all the holidays in this month. I applaud your efforts to teach your children well. As a product of a non-practicing Jew and a Catholic mother we celebrated Christmas. But I always wondered, and still do, what it would have been like to do the Hanukkah thing as well. Knowledge is one of the greatest gifts a parent can give their children. What the children do with it is up to them. I chose Catholicism and we raise our kids as such, but I reach deep and know that we have our Jewish connection somewhere. Perhaps sometime we will try to celebrate both. Happy Holidays to you! Thanks for this wonderful post! Whether what you do in your family is viewed by other people as right or wrong, I think it’s great to see religions coexisting through their respective holidays! I always believed that religion is a subjective issue and if what you do is good for you, as long as it doesn’t hurt other people, then that’s what you should do. Same goes for holidays. It’s unfortunate that we sometimes think we have complete knowledge of the things of God. I for one believe that God wants us to be in unity, not arguing and dividing. Christ prayed that believers would be one with Him as He is one with God. I think your Hanukkah/Christmas celebration is a step toward unity. I pray your family has a wonderfully blessed celebration and that you grow closer to God every moment of every day. Happy Hanukkah/Christmas! We were blessed with the opportunity to work as part of a multi-faith forum, with a mission to end homelessness. (Sadly, a multi-faith problem). So to see collaboration, cooperation, and co-celebration makes me very happy. Happy Hannukah and Merry Christmas to you and your family. I do not know your story, or why you’ve decided to celebrate two faiths’ Holidays in your home, but I applaud you for it. At the very least, the cultural significance of both are important to remember, and at the very most, they’re center to your faith! The only other comment I want to make, is that I’m sad that Advent is reduced in society to cheap chocolate starting Dec. 1st. As much as I enjoy the treats, that’s not Advent. Advent is a litergical holiday starting four weeks before Christmas, It is a celebration of Christ’s birth, and a waiting for His second coming. Knowing Christmas all my life it’s a celebration of love and gratitude among families. It could be with gifts, food or simply by letting them know you are there for them. It’s also about faith , of rebirth, of hope that with the birth of Jesus on Christmas day, we are given a chance to be saved. Yes, Christmas is more the trimmings that commercialism wants us to believe. Happy holidays…. Knowing Christmas all my life it’s a celebration of love and gratitude among families. It could be with gifts, food or simply by letting them know you are there for them. It’s also about faith , of rebirth, of hope that with the birth of Jesus on Christmas day, we are given a chance to be saved. Yes, Christmas is more than the trimmings that commercialism wants us to believe. Happy holidays…. It certainly is a challenge to create a family celebration that is the right combination of interfaith traditions. I like how you have your children make a donation for Hanukkah. I think I will add that to our activities this year. 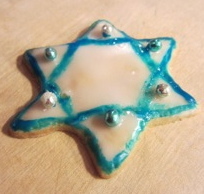 Enjoy your latkes and your Christmas cookies! As a child of an interfaith family, I greatly appreciate your article here and on the Huffington Post. It is a shame how much criticism your open-mindedness has attracted! It is written in the Bible that Jesus calls us to unity. We should not allow religious or even racial differences divide us. Your post was well written and quite encouraging. I am saddened by the amount of criticism you have attracted. That said, when my son was younger I went to the local import store and purchased a wooden Advent calendar for him. It has 25 little doors, all numbered of course. I fill it each year with chocolates that I purchase, that way there is no run to spit it out! 🙂 I hate wasting money. That Advent calendar was his most cherished possession for years. Now his younger sister has taken over the duty of keeping the calendar stocked. We celebrate both, leave out most of the religious connotations but honoring the traditions that we hold so dear. I’m not Jewish and no one in my family is Jewish, but I pay attention to all Jewish holidays. After all, I consider Christianity 100% Jewish. This is so inspiring to see. My own family has been struggling recently with my own decision to pursue a different belief system than that of my family members. I keep telling them it can be done, that acceptance in the home of one faith’s holiday need not equal an attack on the others. Yours is a beautiful example of how separate holidays can exist side-by-side in harmony. I’m writting also from an interfaith home in Argentina, we celebrate hannukah & xmas, with the menorah and the tree. My kids are little (6 & 2), but the old one, began to ask and realize that he celebrates things that his friends doesn’t. Each of us, has our own traditions, and we are building our family new ones! Thanks for your comment and for try to read it in another languadge, Sue. I really apreciatte it!, The thing of interfaith family seems very interest to me, I know that I’m not alone in this race, and is nice to read how people in different countries carry on the process. I thinks the world is full of people like us! So is good to read it.